If you look at the banners in the park, there's a line at the bottom that's been "taped over" with what looks like you guessed it, green tape. Lol is it possible the name was on there or was it a last minute deal they decided to give the chop with the flash sale? I'm curious now. That would not be where the name of the ride would be. It is too low and small on the poster, the name would need a much larger place especially if they had the logo. It would've just been something about the pass deal. Are those the official colors of the ride? I like the green train, but not the actual loop. gottastrata33 wrote: If you look at the banners in the park, there's a line at the bottom that's been "taped over" with what looks like you guessed it, green tape. Lol is it possible the name was on there or was it a last minute deal they decided to give the chop with the flash sale? I'm curious now. I just didn't know if it said what last years did but with this years name (if I remember correctly) "Ride Joker all year long"
I hope they announce something soon because it felt like last year there was a lot more hype going on. SFGAM_Hog wrote: I hope they announce something soon because it felt like last year there was a lot more hype going on. Kings Cake - It is eaten during Mardi Gras, and has to do with the 3 kings (3 Wisemen), and they put a baby Jesus in the middle of the cake. If you get the baby Jesus, you are said to get good luck. Why Kings Cake? This cake is circular like this ride. "Purple signifies justice, gold means power, and green stands for faith." If you look more into Mardi Gras, the celebration starts right after when the wisemen came to see baby Jesus (This is celebrated on Jan 6th every year), and than goes to the first day before the Lent season. If you don't know what Lent means, that means you might give up something to eat or drink for around 40 days until Easter. So, the celebration of Mardi Gras is supposed to be to eat good before you have to give up something for Lent. ^^^^^ Any name but Voodoo. I think that would offend many people, including those from Haiti and New Orleans. Pretty sure with the impending storm coming to Florida if they had planned to wait out before revealing the name Hurricane Force 5, Irma may just cancel the name all together now. So bottom line is they need to select a different name and just be done with it. The GP will react better to the ride possibly if it had a name to go with it. Yeah ditch the name altogether. Create a fitting Mardi Gras theme/name. It'll take them some time to work the new logo/name & graphics onto park maps & promos etc but I how we see a name soon. I am not even a fan of Hurricane Force 5 beyond the current happenings in Texas and Florida. I wouldn't mind Bourbon Street Fireball if they wanted to match the theming. I still wonder how long they can continue to offer passes for $70 for an entire season. It seems like in order to keep the parks up (maintenence) as well as add new attractions, the park is going to have to consider raising prices soon. Wages keep going up, insurance costs, more needs to be repaired as the park gets older. Look at Disney and Universal (I know on a different scale), but they have a yearly increase to keep things $ managable (and yes profit). I am not saying anything crazy, but since they have not raised prices in while would $5 more for daily and season passes stop anyone from going/getting a pass? Let assume that of the 2.5-3 million people who visit per year, that 1 million are daily gate prices. That would be a net of $5 million from daily alone which could add a second ride (non-coaster install year). Not sure how many season passes they sell per year. Plus they would have more money to maybe add an additional attendent to a few rides where one attendent is not enough. Agreed 100% I'm amazed that they're able to keep season pass prices so low! Between property taxes, rising wages, insurance, upkeep, etc. Eventually they should raise the price of a season pass. I for one have no problem paying a little more for a season pass if it means keeping the park in good condition, paying employees well, adding new rides, etc. I wish we had the numbers for season pass sales, food sales, etc Compared to the cost of operation. A Modest $5, $10 or hell even $15 increase in season pass prices would more than likely generate alot of extra money, without chasing too many people away! 1) SF Capital Investments are by a collective not a per park basis so the $5 million increase would not go directly to the park, It goes into the overall revenue of the chain. SFGAMNUT9302 wrote: Agreed 100% I'm amazed that they're able to keep season pass prices so low! Between property taxes, rising wages, insurance, upkeep, etc. Eventually they should raise the price of a season pass. I for one have no problem paying a little more for a season pass if it means keeping the park in good condition, paying employees well, adding new rides, etc. I wish we had the numbers for season pass sales, food sales, etc Compared to the cost of operation. A Modest $5, $10 or hell even $15 increase in season pass prices would more than likely generate alot of extra money, without chasing too many people away! SF clearly doesn't think they can raise prices and not loose a significant number of customers. They based their strategy on low cost and high volume. The most expensive season pass across the chain was MM at $80 during the sale(that was for a gold with the free upgrade). 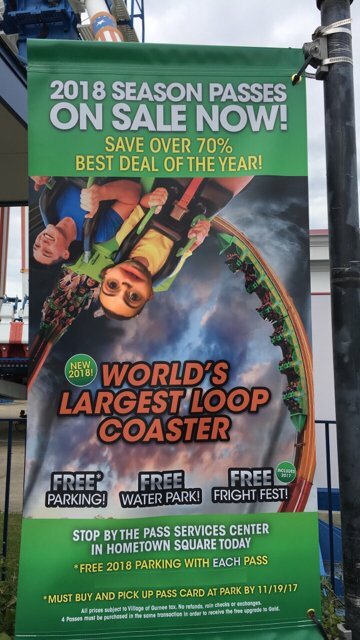 That's less than every US based Cedar Fair park except Valley Fair($75). SF doesn't seem to believe they have the value.ie...pricing power to increase prices. Nobody believes parks like VF, WOF, MiAdv are in on par with SFMM, but they are willing to sell less passes at a higher price and lower volume. That surely keeps some people away from these parks, but the ones that go don't have a zoo atmosphere of the park swarmed by people buying cheap season passes, which SF does at Stl, DK, Am, NE, OG(All were at $55 or less during the sale). I was just using our park since I know the numbers a bit better and what they charge for passes. They could easily do this to all the parks as well. As for the additional $ to spend, I agree, but again if they do not raise the price, they have 0 of the additional revenue to use. If they can currently support the park as is without an increase, the additional $5 (or whatever amount) is pure increased revnue that they would not have had if they did not raise the costs. If a coke at the park is around $5 per cup (without the refill bottle) people would not complain about $5 admission ticket increase when a single coke costs the same. So for sake of argument, they could use $2.50 of the $5 collected (and then use the other $2.5 for the bottom line) and repaint the entire american Eagle in the off season versus a section per year. I was not trying to tie out the numbers as much as saying $5 per head is not going to cause a drop in attendence. They way they have it where they do it maybe every 5-7 years makes it more of a big deal them what Disney/Universal do annually. RobSFGAm wrote: I was just using our park since I know the numbers a bit better and what they charge for passes. You keep talking about using 2.50 of 5 increases for repaint, rides, etc.. That's not how the capital investments work. It's all based on a % of gross revenue. To get a relatively small increase in capital expenditures SF needs massive revenue increases. For example CF spent about 40M more than SF in 2017 on capita investments though both produced the same overall revenue. For SF to have spent 40M more to equal CF, SF under their investment formula would have had to increase revenue by 740M. So, instead of having 1.3B in revenue they would have needed 2.04B. SF has 30M visitors a yr and about 60% are season pass holders.ie..18M. Of that 18M visitors if you say a season pass holder goes 4 times a yr (very conservative estimate), so that's 4.5 M actual unique customers from that 18M visits. If SF raised prices $5 as mentioned before that would be 22.5M more in revenue from pass holders. If you take the 12M non pass holders visitors and raised them $5 that would be 60M more in revenue. Also, we know that many of that 12M non pass holder visitors are BAFF's. But, for simplicity we will ignore that and say they can get $5 more from non pass holder visitors. The combined pass holder and non pass holder revenue will just increase 82.5M on a $5 price hike. That will produce just 7.45M more in capital expenditures and of that 4.5M would be for rides. Even if you bumped the increase to $10 it would be just 9M in ride budget increase. Of course this is all on the assumption there is no decrease in attendance with price increases. SF customers have been used to cheap prices and thus may be very sensitive to price increases. SF doesn't seem willing to test that b/c the prices have been stable for years now. Should SF increase prices? Yes, but it will not have a large impact on capital investments under the formula unless it's a massive increase. The numbers come out that every 100M increase in revenue is just 9M in capital expenditures of which 5.4M is for rides. Will they have to increase prices at some point? Yes, b/c there number of people you can sell passes to will plateau or have insignificant increases. They have almost doubled pass holder %'s in the last 6 years. At some point almost everyone who wants a pass will have one despite the lure of cheap prices. The other problem they have is the per visitor spending is decreasing year after year. So, people seem to buying cheap passes or coming as BAFF's and not spending out of pocket that much. SF in my opinion needs to create desired benefits in a more tiered pass structure...ie Regular, Silver, and Gold. A season pass with like three built in fast pass rides per trip would be amazing. They could build them into your card and the person scans the card when you get into the fast pass line. I would easily pay 100+ for that. Really think this is how fast pass should work. Build them into everyone's ticket price, and the higher the ticket, the more fast passes you get for the day, but its not unlimited (max like 10 maybe?). Y'all ever heard the marketing phrase "Give them the razors... Sell them the blades..."?